Also be sure to see the FAQs for other important dates to keep in mind. Eligibility: Who Should Enter USEF? 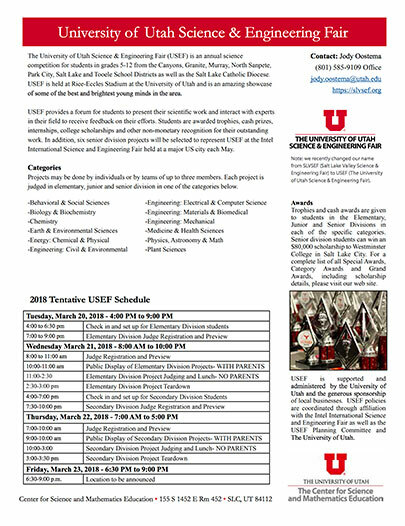 The University of Utah Science & Engineering Fair is designed for students in the 5th-12th grade currently enrolled in a public, private, parochial or charter school in the Granite, Murray, Salt Lake, Park City, Canyons and Tooele School Districts. Students compete in the divisions listed below. Read about how projects are judged. Free parking will be available in the large parking lot just west of the Rice-Eccles Stadium Tower. No parking pass or permit will be required.